Oh and "Patty Varone" the cross-dressing Giuliani playing his own she-male body guard. Check out YouTube user random331's video entitled "DID 3,000 PEOPLE REALLY DIE ON 9/11 ??" I'm sensing that, with Simon's latest volley, we may be approaching (if I may reappropriate the much abused term) a true zeitgeist. And meanwhile a shill channel has appropriated the title of Simon's video tacking on the addendum ;) "Part 2". It has no substance whatsoever of course but is merely another lackluster and vapid straw-grab hoping to ride the coattails of what is authentic in the exact same manner as Genghis and Jo Cressy's slander n stalker blog. Even as they go under the perp shills remain hollow mimics. Unfortunatley, Simon's video comments gives a platform to worthless creatures who otherwise wouldn't exist. Ozzy, time is too precious to waste on worms! Aries "I really have no﻿ idea what your trying to say." NW hor d'oeuvre "How do you know smarty pants, where you there too." are all one and the same person! And meanwhile a shill channel has appropriated the title of Simon's video tacking on the addendum ;) "Part 2". Can you post a link to that ? It seems to me he's infringing on your content. & still no word from the grieving families themselves. Their silence is deafening. I can find neither Birth nor Death records for that "person". If I were a grieving family member who saw that my dead family member's face was visually distorted by the news media and represented by bad actors who pretended to know them, I would immediately raise a stink about it and sue those CIA guys out of existence. Apparently, the actors and computer generated fakery are acceptable to those people; if I were them, I would not stand for it. It would be the most outrageous thing ever! Oh, wait ... maybe there are no family members of the dead people because the "dead people" are all invented entities managed by secret service projects. sh#t. Why didn't we think of that? Oh yeah .... we did! ... which also explains why none of us has been sued for slander, for publishing 'lies' about their 'dead loved ones/victims'. Truth, of course, is an absolute defense to charges of slander/libel. Further, even if these vicsims are actually real humans who are really dead, most states don't permit slander/libel suits against the dead. We appear to be home-free either way. That may conclusively explain the the lack of suits against any of us. You see, we haven't slandered anybody! You can't slander Little Red Riding Hood can you? We simply don't "be-LIE-ve" their bullsh1t. Is it to give creedence to a LIE? Belief in a man in the sky? We run with their LIES. Further, even if these vicsims are actually real humans who are really dead, most states don't permit slander/libel suits against the dead. Who is slandering anyone, fbenario? Point out a time when we have not been respectful of the dead who may truly have lived. 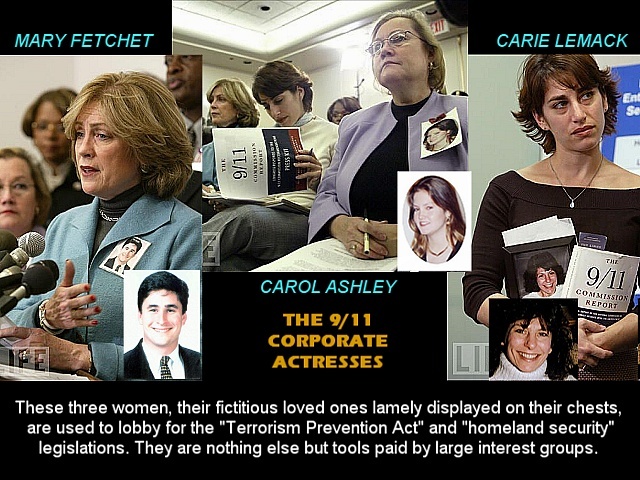 We have sufficiently made the case for there being no real death victims of 9/11 and have consistently asked the actors to prove they knew someone, even when it's clear they are bad actors. Hoi, I certainly don't think we have slandered anyone in any way. I have gotten responses from people when I talk about media fakery and vicsims that accuse me of disrespecting/slandering the dead. My post here was merely laying out the reasons why we essentially CAN'T be found guilty of slander, so that if anyone here gets hit with that kind of accusation themselves, they've got my response at their fingertips. "Currently running her own national security business, The Camilla Group, LLC, Carie remains focused on working with government, private sector and nonprofit organizations to improve the nation’s safety and security. She initiates and implements forward-thinking projects on critical homeland security issues, such as the prevention of nuclear terrorism and improved aviation security. Carie received her BS from Stanford University, MA from Harvard University, and MBA from Stanford University. She is a term member of the Council on Foreign Relations and is a lifelong member of Red Sox Nation."